Tuesday will be warm and breezy and/or windy in the Rio Grande Valley, according to the National Weather Service in Brownsville. The winds will blow from the southeast under partly cloudy skies. Brownsville and McAllen will be 86 and 89, respectively. Rio Grande City is expected to reach 92. South Padre Island will be 78. 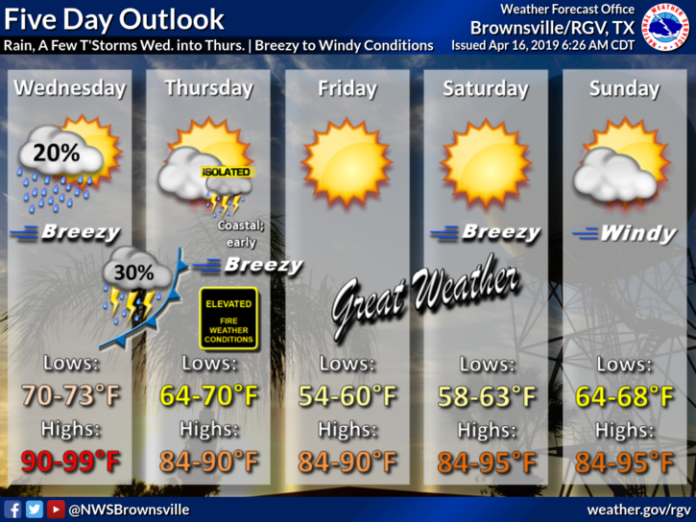 Expect breezy to windy conditions for much of the rest of the week. Chances for showers will be possible Wednesday, especially at night when a weak cold front will bring with it a chance for thunderstorms. Low temps Wednesday will be in the 70s with highs in the 90s. As skies clear Thursday, elevated fire weather conditions will develop, especially in the western portions of the Valley.